Equality Now, a women’s rights organization, is calling on the Burkinabe government to toughen its efforts in the fight against Female Genital Mutilation (FGM) in the wake of a report that 50 girls had suffered complications after undergoing the illegal procedure. The circumcisions reportedly took place in the first week of September in the Kaya area, about 100 km (62 miles) north of the capital, Ouagadougou. Even though media reports put the figure of affected girls at 50, the minister of women’s affairs Laurence Marshall Ilboudo noted that it could be higher because not all of them had been traced. About 12 of the girls have been admitted to the Kaya Regional Hospital and 38 to the Chiphra Protestant Hospital in Ouagadougou. Some of the girls had suffered serious complications, local media reported. According to Jean-Paul Murunga, program officer for ending harmful practices for the NGO Equality Now, a lack of funding of a national committee dedicated to the task is the main reason for resurgence of the practice. The government needs to respond faster so that these girls are protected, he said. 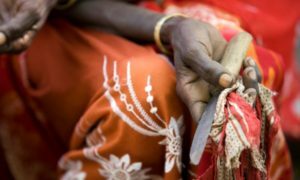 Ironically, this year Burkina Faso is hosting a worldwide conference in which the African Union is going to declare a war against FGM. FGM can cause chronic pain, menstrual problems, recurrent urinary tract infections, cysts and infertility. Some girls haemorrhage to death or die from infections. The practice, prevalent in nearly 30 African countries, has been banned in most African countries, but enforcement of the law is usually weak and prosecutions rare. It is legal in Mali, Sierra Leone and Sudan. Posted by Geraldine Boechat on September 19, 2018. Filed under News. You can follow any responses to this entry through the RSS 2.0. Both comments and pings are currently closed.